Charles Rennie Mackintosh (7 June 1868 – 10 December 1928) studied evening classes at the Glasgow School of Art between 1883-1894, winning numerous student prizes and competitions including the prestigious Alexander Thomson Travelling Studentship in 1890 that allowed him to undertake an architectural tour of Italy. While a student, Mackintosh also worked as an apprentice architect, initially for local architect John Hutchison, and then after 1889 for the architectural practice of Honeyman and Keppie. In 1896 Mackintosh gained the commission to design a new building for the Glasgow School of Art. This was to be his masterwork. The School also houses a large collection of pieces by Mackintosh including items of furniture and works on paper. Our archives also hold material relating to Mackintosh’s student career, including a travel sketchbook from his tour of Italy in 1891, flower sketches, a photograph album of Mackintosh and his friends and The Magazine a four volume publication including work by Mackintosh and his fellow students. 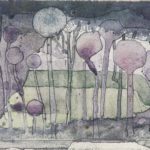 Further information on Charles Rennie Mackintosh’s life and work can be found on our online catalogue and on The Charles Rennie Mackintosh Society website. Today the public can visit our Window on Mackintosh visitor centre and undertake a guided tour of the façade of GSA’s Mackintosh Building. The tour also includes an opportunity to visit a new gallery in the Reid Building where twenty key pieces from GSA’s collection of Mackintosh furniture are on display. GSA staff can book time in the gallery to support their own research or to take groups of students to view the furniture as part of a programme of teaching.